In the new SU mini catalogue, there is a scrapbooking page. This is my version in the way of a card. I love the colour and my new favorite things are the the corduroy buttons. The paper I used is baja breeze, basic grey, and Walk in the park DSP. I also used the 1" double stitched baja ribbon. The going grey paper was punched with the new eyelet border punch. 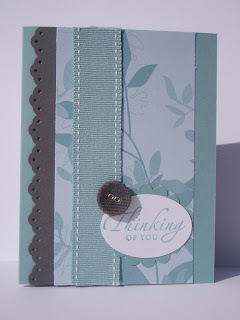 The stamp set I used here was Sincere Salutations with baja ink, then punched with the wide oval and scallop.